The ingenious idea of bringing one of the UK’s favourite films to the stage, almost verbatim, and attempt to reproduce it, ‘frame by frame,’ has garnered many awards since its realisation in 2006. However, the real proof of this tongue in cheek, stiff upper lip pudding is in the taking in of it, for, despite its four person cast, it’s an all cylinders firing, hugely enjoyable experience which must really be seen to be appreciated. That said, there was a positive buzz in the house on the occasion of the 4th Birthday celebration of this hilarious production. Did I say hilarious? It’s a word I’ve rarely if ever put into writing. But it’s the morning after I’ve experienced The 39 Steps and I’m still smiling and, marvelling at my fond recollections of it, as well as already wishing to see the show again! Bringing a popular film adaptation of an equally popular novel to the stage is nothing new, but what’s so original about this production is that not only has the script from Hitchcock’s 1935 film been adapted for the stage, but seemingly, all of the film’s cinematic physicality too, in suitably low tech ‘30’s style. So in effect, what remains to be seen, thanks to the show’s two visionaries, Simon Corble and Nobby Dimon, is a retro film to stage adaptation, with period ‘state of the art’ special effects, such as paper bi-planes on sticks looming large behind a curtain, casting surprisingly effective North by Northwest shadows, which the shadow of the story’s unwitting hero, Richard Hannay, must then wildly dive to the ground to avoid. It’s also the old time earnestness and, Monty Phythonesque facetiousness of the acting which makes this show so endearingly funny. 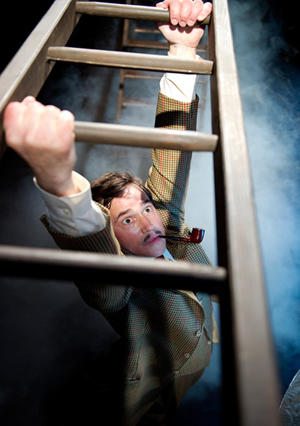 Yet for all that, the production also allows its audiences to honour its humour-rich source, Hitchcock’s film adaptation of John Buchan’s novel, which all things considered, particularly the passing of years, makes The 39 Steps at the Criterion Theatre quite a marvel! Despite his obviously educated, middle-class status, thirty seven year old Richard Hannay is bored. He lives in a ‘dull rented flat’ in London’s Portland Place where seemingly, nothing’s going on but the rent. Banal distraction is what’s needed, so, (big laugh from the audience) he decides to take in a West End show. Cut to the London Palladium where weasel like, tuxedoed Mr. Memory busily recalls hoards of facts off the top of his encyclopaedic head. Despite his initial incredulity at this oddity, Hannay’s mind drifts to the adjacent box, where a mysterious dark-haired woman in black has responded to his attempts to conduct a hushed conversation. Suddenly a shot is fired and the woman invites herself to Hannay’s flat, where she points out two trench-coated men near the lamppost outside who’ve been following her. When she staggers out of his bedroom with a knife in her back later, disturbing Hannay’s kip on the sofa, it falls to him to foil their plot to smuggle vital British military secrets out of the country. But what are The 39 Steps, you ask? That’s something that’s never made clear, even in Buchan’s novel, so Hitchcock used it as the code name for his spy group. Ladies being first, elements of the story that Hitchcock himself invented, such as Hannay’s love interest, Pamela are not only retained here, but comically enhanced, through the heightened physicality and skilful expressiveness of Dianne Pilkington, who also does wonders with all of the other female roles in the production from that classic woman of mystery Annabella Schmidt to Margaret, the starry-eyed young farm wife Hannay dazzles in passing. In each role Ms. Pilkington encourages laughs, at times, with little more than a look. And from the naturalistic, casually womanising way David Bark Jones plays Richard Hannay, it’d be hard to picture anyone else playing the role, as his Hannay’s like a lovable, but foppish thirty-something Roger Moore and Michael Palin rolled into one, with a bit of ‘have a go’ boyish charm thrown in. Hannay’s legacy of roguish charm a la Hitchcock has subsequently carried on through an inadvertent lineage of ‘heroes’ stretching from comic books through James Bond to Indiana Jones and beyond. Bark Jones does his Hannay proud and the audience instantly responds to his smartly befuddled, tweedy character with enthusiasm and much laughter of recognition. After all, isn’t a true anti-hero generally a chap who’s a bit bored and unwittingly gets drawn into an adventure while he’s simply minding his own business? In Bark Jones’ capable hands, it doesn’t take the audience long to realise that their role is to cheer the ignoble Hannay on, and it’s something they adapt to with considerable relish. That leaves a myriad of characters to talented Timothy Speyer and Jeremy Swift who are each, in the programme, simply titled ‘Man.’ However, in addition to playing an understandably grumpy farmer in one hilarious (there’s that word again) scene, Speyer also plays whatever non-beauteous female roles are going, with garters on his black socks, a nod to English Music Hall’s tradition of female impersonators, which, ties in neatly with the theatre within a theatre ‘London Palladium’ aspect of the show, which the story returns on the circular path to its conclusion, fitting, as Speyer is also the sputtering Mr. Memory. In another memorably comic scene, Swift switches between station attendant and Bobbie in record time, altering his accents and mannerisms accordingly, before adding yet a third characterisation to the mix! 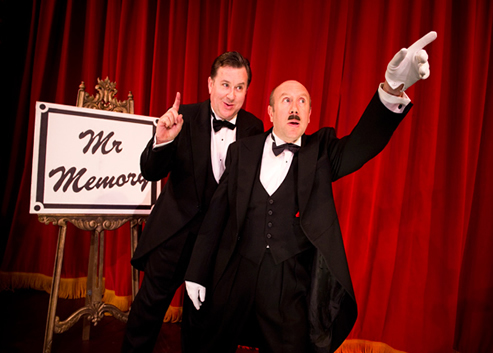 Timothy Speyer and Jeremy Swift perform a kind of comedic alchemy between them and much hearty applause and raucous cheering is due to both of them! The set, designed by Peter McKintosh, is the aforementioned old leather and whiskey ‘dull rented flat’ of Richard Hannay, which is enshrouded with darkness as the need for mysterious circumstances arise and curtained, as cited, and cleverly under-lit and/or over-lit, thanks to the Lighting Design of Ian Scott, for action scenes, which allow shadows to loom or recede a la long shot, such as one in which Hannay escapes over the Scottish mountains in his unsuitable, gentlemen’s attire. In such cases, a spot of masculine narrating occurs amidst the wonderfully organised chaos. As well as heightening tongue in cheek tension, Mic Pool’s sound design also pays tribute to some of Hitchcock’s other masterpieces, like Rear Window, Psycho and The Man Who Knew Too Much, as does Patrick Barlow’s similarly inclined well done adaptation. Movement Director Toby Sedgwick has outdone himself with understated business such as Hannay’s climb from one of the theatre’s boxes down to the stage via a rope, after which Bark Jones’ Hannay, metaphorically wipes his brow before stoically claiming, ‘I’m alright.’ However, perhaps the truest wonders of this challenging to stage production is the finely observed and tuned directing of Maria Aitken, who has enabled the actors to agilely balance astride the fine line between mayhem and bemusement. But everything about this show has been carefully orchestrated and rehearsed, in order to enable its action to appear more or less spontaneous, right down to the arrival of an armchair under an actor’s bum at the precise moment that he might have otherwise sat on air! The result of such hilarity and that of instances such as a scene in which dense fog is required, but intentionally stalled, so that Bark Jones as Hannay must repeat his ‘cue’ in an increasingly impatient manner, only serve to add to the homey, ‘30’s / parallel ‘out-take’ feel of the production, which ultimately makes it such a thoroughly charming, unprecedentedly entertaining experience! This production’s ‘Off West End’ theatre origins at London’s acclaimed Tricycle Theatre have doubtless, also helped to inform its expansive capabilities to their present impressive status. To paraphrase Winston Churchill, one of the tag-lines of this show should really be, ‘never have so many been entertained by so few,’ because its entire cast of 139 characters is played by just four versatile actors and this is all achieved in 100 minutes, making The 39 Steps makes a more than fitting predecessor to the Criterion’s long running Reduced Shakespeare company's shows.. Not that I’m comparing, for if I had to come up with four little words to describe this show, they’d definitely be ‘one of a kind.’ And The 39 Steps has now actually become the longest consecutively running show in the 136 year history of the Criterion Theatre. Though I’ve seen hoards of productions over the years, many of them comedies by claim, I’ve never seen anything quite like The 39 Steps, in that Its fond way of looking back at its’ own time frame at the same time that it allows for the finer sensibilities of its’ contemporary audience is uncanny, something which the novel’s author John Buchan, who dubbed Hitchcock’s film, ‘a better story than mine,’ would have no doubt, loved and appreciated, just as the cheering crowd the night we there, were laughing among them did. This production is the perfect antidote to the usual starched drawing room comedies so often dangled as tourist lures in the West End for both natives and visitors alike, as it laughably turns such high-buttoned notions on their heads! Happy 4th Birthday to this welcoming, fun-filled production of The 39 Steps and many, many more! The 39 Steps runs approximately 1 hour 50 mins including interval. N.B. Strobe Lighting and Gunshots are used in this production.